From Goodreads ~ I don't mean to meddle, honest! But can I help it if my nose for injustice is as keen as my green thumb? Now I, Abby Knight, law school dropout, am the proud new owner of Bloomers, my hometown flower shop. I'm devoted to making my business grow but I'm no shrinking violet if someone needs my help to right a wrong -- even if that person is already dead. So maybe Abby's life isn't the bed of roses she was hoping it would be. She adores her job but a new low-cost competitor is killing her profits - and a black SUV just rammed her vintage Corvette in a hit and run. Determined to track down the driver, she accepts the help of hunky ex-cop Marco Salvare. But their budding relationship is threatened when the trail turns deadly. Now Abby is caught in a tangle of menacing phone calls, police corruption, and murderous road rage. If she's not careful, the next flower arrangement might be for her own funeral. Abby was going to law school to fulfill her mother's dream of her becoming a lawyer. But she wasn't passionate about it and ended up dropping out ... which prompted her rich fiancé to break up with her. She buys the flower shop where she'd worked part-time as that's where her interest lies. Just as Abby has parked her vintage Corvette one day, someone runs into it and takes off. Then she discovers that there was a murder nearby and she thinks the person who ran into her car is the murderer. She is determine to find the murderer and bring him to justice with the help of the nearby hot restaurant owner who used to be a cop and now works as a part-time private detective. 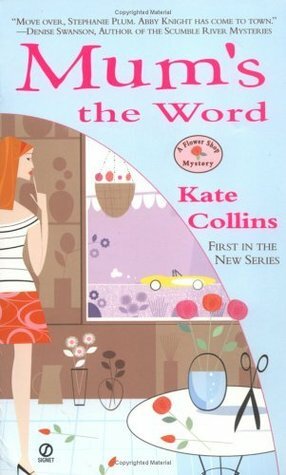 This is the first book in the Flower Shop Mystery series. It caught my eye because I recently read that Brooke Shields is starring in this series. Not that I'm a big fan of Brooke Shields but I like reading books in a series so I thought I'd check it out. I liked the writing style ... it was easy to read and flowed well. It was a bit of a stretch to believe that a former law student/now the owner of a flower shop would get THAT involved in solving a local murder just because they hit her car, even though every one was telling her to stop "meddling". There is the beginnings of the romance between Abby and Marco, the restaurant owner. This book was okay. I liked it enough to give the next one in the series a try. Given that Abby is in her 20s in the book and Brooke Shields isn't (by many years) in the movies, no doubt they will take some liberties.